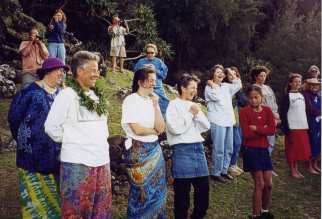 On February 15, 2003, members of Halau Kahiko Ha Lapa I Hula Alapa`i and Ha`awi Hemolele O Keakawaiola came together with our Kumu, Roselle Keliihonipua Bailey to share with a group of Healing Touch practitioners from West Michigan our mana’o of the chants and kahiko dances at Keahualaka. 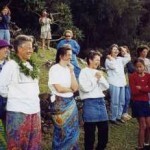 The group had requested to have an experience at this sacred place because many of them had been moved by the experience they had there during the Healing Touch International Conference in 2000. 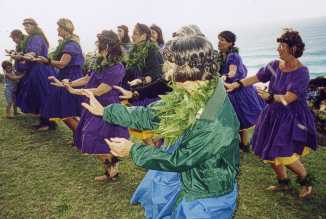 That year Roselle had led a workshop at Keahualaka. Her teaching and chanting brought tears to many of the participants as they connected with the sacred energy there at that time. 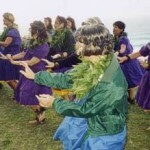 This time the group made a generous donation to Kaimi…..It was a joyful and educational experience for all.